The present system cannot be patched up — it has to be completely transformed. The structures of the parliament, army, police and judiciary cannot be taken over and used by the working people. Elections can be used to agitate for real improvements in people’s lives and to expose the system we live under, but only the mass action of workers themselves can change the system. Workers create all the wealth under capitalism. A new society can only be constructed when they collectively seize control of that wealth and plan its production and distribution according to need. We live in a world economy dominated by huge corporations. Only by fighting together across national boundaries can we challenge the rich and powerful who dominate the globe. The struggle for socialism can only be successful if it is a worldwide struggle. This was demonstrated by the experience of Russia where an isolated socialist revolution was crushed by the power of the world market — a market it could only contend with by becoming state capitalist. In Eastern Europe and China similar states were later established. We oppose everything which turns workers from one country against those from another. We oppose all immigration controls and campaign for solidarity with workers in other countries. We support the right of black people and other oppressed groups to organise their own defence and we support all genuine national liberation movements. We campaign for real social, political and economic equality for woman and for an end to all forms of discrimination against lesbians, gay men, bisexual and transgender people. Those who rule our society are powerful because they are organised — they control the wealth, media, courts and the military. They use their power to limit and contain opposition. To combat that power, working people have to be organised as well. 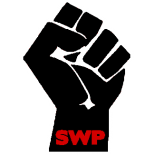 The Socialist Workers Party aims to bring together activists from the movement and working class. A revolutionary party is necessary to strengthen the movement, organise people within it and aid them in developing the ideas and strategies that can overthrow capitalism entirely. We are committed to fight for peace, equality, justice and socialism. Join us.